Great pieces of Blue Calcite from Mexico, each with good colour. The brown/grey staining so often found on rough Blue Calcite is minimal making these pieces a definite blue ! Calcite is believed to help with skin and intestinal complaints and is said to help ensure the proper functioning of the kidneys, pancreas and spleen. It is thought to both strengthen the heart and to normalise its rhythm as well as encouraging the healing of tissue and bones. Calcite promotes a sense of stability and constancy and teaches us to trust in our own judgement and to overcome difficulties and setbacks. It is an energy amplifier, particularly effective against laziness, and it helps to make us more energetic and industrious. It helps us to put our ideas into action and makes us more successful. Calcite is a wonderful stone to work with when studying the arts and sciences. It is said to enhance our memory and is an excellent crystal for those who have lost hope. Calcite is particularly effective at speeding up our spiritual development. It makes us much more aware of our psychic abilities and helps us to realise that we too, may be able to channel information and to have out of body experiences. Calcite is a spiritual teacher for all of us and is also a crystal that helps us to better appreciate the creative forces of nature. 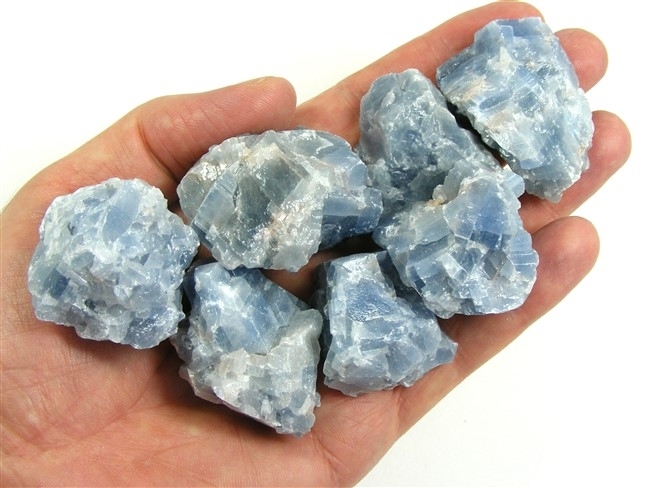 In addition to the above properties, Blue Calcite is also useful for lowering blood pressure and easing pain in general, but especially pain in the back. 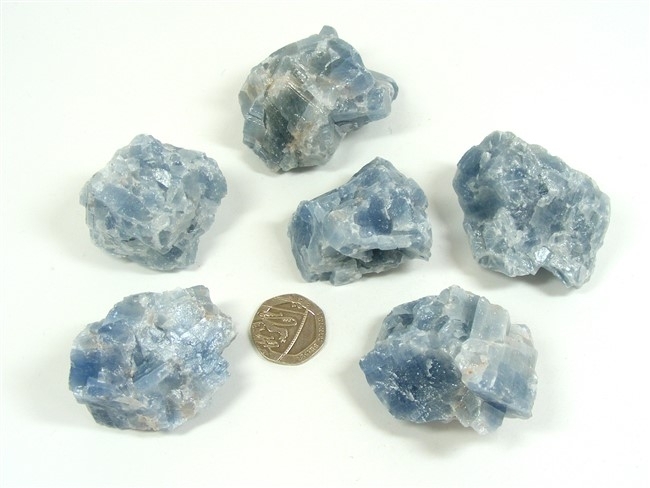 Blue Calcite is a good stone for those needing to relax more or those recovering from an illness. It helps to soothe our nerves and can help us to let go of anxiety. Blue Calcite is an aid in clear communication, especially where there are some who can't or don't see your point of view. It also helps in the release of those negative emotions that no longer serve us. We hope you love working with this beautiful stone, but we just thought that you might like to know that virtually all the rough / natural Calcite that you see for sale, whether it's orange, blue, green or red, has been treated almost as soon as it was mined by dipping each piece into a weak solution of acid. This acid may be as mild as vinegar (acetic acid) or it may be a special blend whose exact ingredients are closely guarded by the mine owners themselves. Each mine thinks they have the best treatment! The Calcite pieces are then thoroughly washed and rinsed off with water. So why would they do this? Well, Calcite when mined is so soft that, if left untreated, it would probably crumble away in your hands when you picked it up and this "acid dipping" process as they call it, stabilises the piece so that it can be handled without falling apart all over the floor. This process also gives Calcite that very noticable "waxy" fell, rather like handling a candle !